Add light and space with a beautiful orangery. Ultraframe orangeries come in a range of traditional and contemporary designs to suit your home. With each of our orangeries, you will find impressively high ceilings to maximise space, thick pillars that provide both grandeur and privacy. Cutting-edge thermal technology in your roof will reward you with all-year-round comfort. So, whether you opt for our traditional or modern orangeries, your brand-new room will stand out for all the right reasons. Orangeries have their modern roots in 17th century Holland. The concept, though, may be much older. There are records of buildings similar to orangeries in 14th-century France, and the Romans had built glorified greenhouses many years before that. The word 'orangery' comes from the 16th century. Initially, these orangeries (as the collection of trees was known) stayed in the gardens. But, with the introduction of plant pots, they were brought indoors. Stylish contemporary orangeries that offer maximum light, yet feel solid, warm and cosy even throughout the colder winter months. They combine the Ultrasky roof, super-insulated columns and a hidden structural goalpost. Proving to be a worthwhile investment for any property, the contemporary design of our orangeries offers a modern flair. This design combines bi-fold or sliding doors with full height windows and an unrivalled choice of modern finishes. This means you’ll be able to enjoy a new addition to your home that allows you to benefit from heightened standards of accessibility and practicality. The super-insulated columns mean our orangeries will deliver comfort and style in equal measure. Adding solidity to a modern design, while delivering thermal efficiency levels five times higher than brick. Lantern orangeries use a lantern roof light to sit on a flat roof or deck. This floods your home with natural light, creating a stunning focal point of your home. Operating as a cutting-edge home improvement solution, these orangeries are a high-performance choice for any home. A traditionally built design featuring the Ultrasky lantern comprises an elegant 25° pitch designed to flood your home with light, the Ultrasky lantern creates a focal point be it over a table or kitchen island. A three-tier flat cornice in anthracite grey adds contemporary style to any of our orangeries, while adding shape to the roofline and hiding the gutters. This structural goalpost is designed to eliminate deflection on large spans of bi-folding or sliding doors and is completely hidden for simple sightlines. Spans up to 6 metres. High-performance glass and a fully thermally broken structure give Ultrasky exceptional thermal performance. Available in any colour and uPVC or Aluminium, there are very few bars, and no bulky radius ends - resulting in a minimalist design. Double glazed aluminium bi-fold doors in anthracite grey. Build a stand-out orangery extension that’s packed full of features designed to make your room cosy and stylish. Your new space can be built to conform to different styles, so you’ll be able to ensure our orangeries meet your design specification. Your modern orangery roof will be fitted with high-performance glass that will limit solar ray penetration during summer but stop warm air escaping when its needed at all other times. The technology used in your roof will create a space that is efficient at retaining heat, resulting in a lower U-Value and lower running costs. Ultraframe roofs are meticulously designed and tested to ensure lasting quality. A 10-year manufacturer warranty will come with your purchase for your peace of mind. Ask your installer for further details. French doors open out on to the garden to bring the outside inside. High-Performance glass reduces solar glare and retains heat to reduce heating bills and ensure our orangeries remain a comfortable temperature, whatever the weather. Choose Quantal Aluminium, Classic Roof or Ultrasky Roof in any colour. Ultraframe orangeries include a range of features designed to enhance your living experience and improve performance. You’ll be able to choose your preferred design, resulting in a tailored construction that is appropriate to your requirements. We use high-performance glass in our roof systems, so that our customers can relax in comfort in a space that’s the perfect temperature all year. Our orangeries are designed to meet – and wherever possible – exceed thermal recommendations. Improve the already-superb performance of your new room by choosing from a range of exciting enhancements. We strive to meet the highest standards with our market-leading orangeries. A 10-year manufacturer guarantee is included to cover you in the event of something unexpected happening. 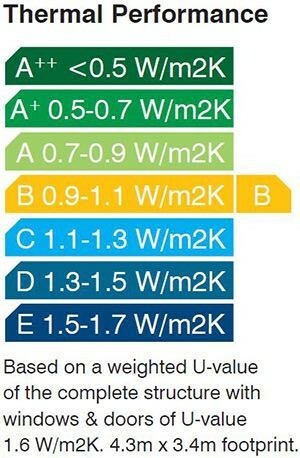 Ask your Ultra Installer for further details. Every product we offer is unique, and our Lantern orangeries are no exception to that rule. Yours will be packed with lots of exciting features that will enhance your experience. In this instance, you’ll be able to enjoy the benefits of square/rectangular lantern with a flat roof. Enjoy a warm and comfortable room, thanks to the market-leading glass used in all of our systems. The glazing in your roof will limit solar entry and stop warm air from escaping, making our orangeries extremely heat efficient. 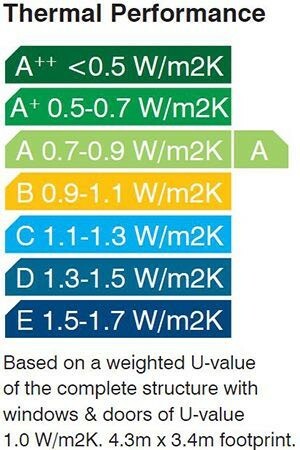 Depending on the options you choose for your new installation, the thermal performance of your new room could vary. Our structural goal post arrangement works closely with the roof beam in the Ultrasky to take pressure off your frames and doors. This technology is hidden within the roof system to ensure the wonderful sightlines of communicated by your Ultrasky roof aren’t diminished, while at the same time maximising light penetration. The structural goal post is light in weight, easy to install and can be concealed within brick piers or Ultraframe super-insulated columns. If you want to include wide-spanning bi-fold or sliding patio doors, our technology will let you do so – because the structural goal post allows for widths of up to 6.5m. Add super-insulated columns to communicate a sense of grandeur and style. Our columns are aluminium cladded and flat or fluted. Small columns sit at the corner sections of the structure; the larger ones work best when used inline. 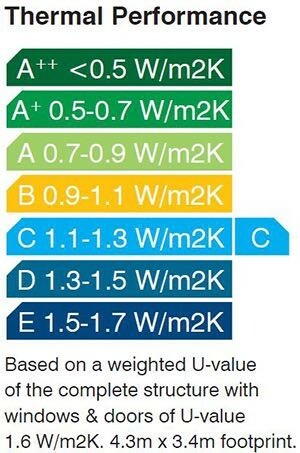 The Ultraframe roof sits on the columns and is insulated using enriched expanded polystyrene and styropor carbon, delivering U-values as low as 0.16 (the thermal performance of our columns is five times higher than that of a brick pier of equivalent size). A decorative cornice will enhance the look of your new room by hiding your guttering and delivering improved external sightlines. Our cornice can be fitted in one of three flat tier formats. They look modern, sit at 90° angles, and can be used on large, normal or small builds. We also offer a curved cornice that is compatible with all orangery styles. Ultrasky’s revolutionary roofing system puts warmth and light at the heart of your orangery design. Guaranteed for ten years, the market’s strongest glazed roof is designed to flood your new room with light. This way, you'll be able to enjoy a bright and spacious feel, no matter what time of the year it is. The strong thermally insulated ridge at the centre of every Ultrasky design reduces the need for multiple bars to maximise the amount of glass, creating the perfect living space whether you’re entertaining, relaxing with your family, or having a cosy night in. The careful selection of high-performance glazing ensures that your orangery is a versatile living space, which can be used all year round and can be combined with further finishing touches, such as underfloor heating to create extra luxuriant comfort for your living space. 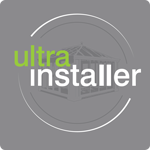 Ultra Installers, who specify and select Ultraframe's roof systems, can design and install orangeries of the highest standards and take care of any 'red tape' in the form of planning permission or building regulations that may be required. To ensure you get a stress-free, smooth and efficient orangeries installation, all of our Ultra Installers are tested and assessed before they are approved. This means that you won’t have to settle for anything less than the highest standards of professionalism, reliability, efficiency and promptness across the board. Find your nearest Approved Ultra Installer by using our search tool. You'll be able to enhance your home with a standard of orangery that excels in all areas of performance and design. We invest heavily in the research and development of our products to ensure we only offer you the very best that the industry has to offer. Install excellence in your home, with ease. Watch our Orangery film from an Ultraframe customer featuring an Internal Pelmet. Uncover new and exciting ways to bring your brand new orangery to life. What is an orangery and what is a conservatory? What are the differences between the two? Discover the benefits of conservatories and orangeries and decide which is best for your home. Check out our beautiful gallery of orangeries. Orangeries are a luxury option for any home, promising to be a hit. "The best thing we ever did!"